The Society of Scribes and Illuminators Well-established and respected calligraphy society and the Society for Italic handwriting’s parent organisation. The Calligraphy and Lettering Arts Society Also known as CLAS, the largest lettering society in the world. Publishes The Edge magazine, covering all aspects of calligraphy. The International Association of Master Penmen, Engrossers and Teachers of Handwriting Also known as IAMPETH, an international association dedicated to practicing and preserving the arts of calligraphy and fine penmanship. The Writing Equipment Society The collection, study and use of writing equipment, old and new. The Pen Room Celebrates the Birmingham pen trade and the lives of manufacturers and workers. Nicholas Caulkin (aka “nickthenibs”) Nick has over thirty years experience in the art of fine handwriting. Calligraphity A mail order book service specialising in books for calligraphers. John Neal Bookseller Books, tools and materials for calligraphers. Publishes Letter Arts Review. 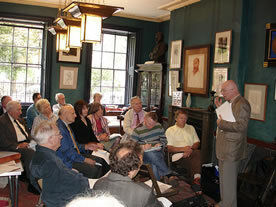 Former Chairman Graham Last speaking at an SIH AGM at the Art Workers' Guild. Photograph courtesy of Ludwig Tan. 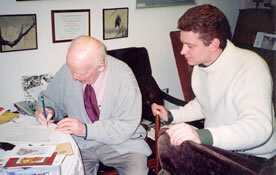 Foster Neville with Tom Gourdie, MBE, prolific author and tireless advocate of Italic, at his home in Kirkaldy, December 2001. 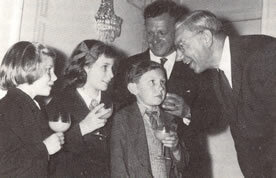 Photograph courtesy of Ludwig Tan. © Copyright The Society for Italic Handwriting. Website development by Hiltonian Media. Handwritten titles by nickthenibs.